Our Destination Consulting team provide leading edge advice to destinations seeking competitive advantage in a changing world. We work with owners, managers and developers of destinations ranging from regions, cities and mixed-use developments, through to artistic and cultural attractions, leisure parks, resorts, and event and sport venues. With our head office in London, we team up with our Colliers colleagues around the world and with masterplanners, architects, engineers and other professionals to help you throughout the development journey. Our philosophy is what helps set us apart from our peers. Keep up to date with our latest news and views. Don't take our word for it, have a look at what our clients say. There is a positive outlook for tourism in Saudi Arabia, with strong growth forecast and a wave of investment underway. 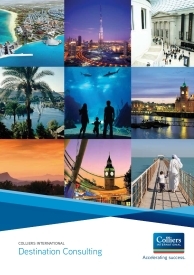 At a total contribution of SAR 190bn in 2015, Travel & Tourism is currently the second highest contributor to Gross Domestic Product (GDP) growth in Saudi Arabia.